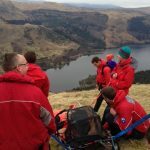 A 30 year old female slipped while descending and sustained a suspected broken ankle. Fortunately, the location was quite close to the road, so were we able to quickly attend the incident with a few team members who were not attending the Birk Side incident. The casualty was treated at the scene and taken to hospital in Carlisle for X-rays by another member of her group. 15 Team members – 1 hour.